Making sure your cat feels welcomed and loved on a daily basis is part of being a good cat owner. If you have multiple cats jealousy can happen, so make sure they all have your attention equally. 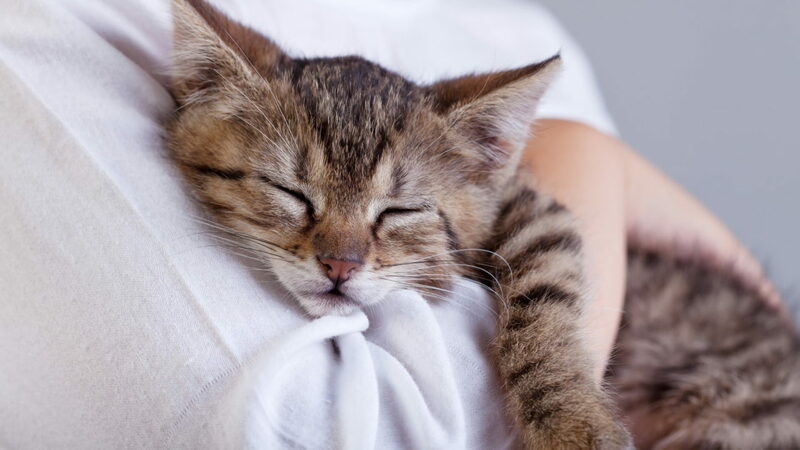 Here are 10 ways to make sure your cat knows you love them and welcome them into your family. My cats love receiving treats. There are many different flavors and even textures. Be sure not to overdo it as most treats are equal to that of human junk food. Once or twice a day, a few treats at a time is fine. 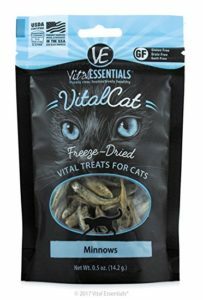 If you want to treat them to some extra special treats, check out Vital Essentials cat treats. They allow you to feed your cat real fish (in freeze-dried form). Cats spend a good amount of their life sleeping so it is important for them to each have their own spot. This can be done by offering boxes, beds, clean closets, or other cat-safe hideaways. Most cats prefer a place that is quiet and comfortable. Petting is a great way to show your cat you love them. If you are sitting down for your favorite show, invite your cat to join you and pet them as you watch TV. They will enjoy it and their purr is actually good for your bones! It is a win-win! Cats like to be stimulated and this can be done by training. You train them the same way you do a dog. Sitting, giving paw, and even speaking are all doable. My cat, Twiggy, actually gives his paw for food without even being commanded to. Training is a lot easier when a cat is raised with a trained dog. If you have a dog, allow your cat to watch his actions and his rewards. They are very intelligent animals and will mimic what they see most. Brushing your cat and even bathing them is very important. This will not only cut down on hairballs but release happy endorphins from your cat’s brain which balances energy and lowers stress. Brushing them also establishes a deep connection and bond between the two of you. I recommend using the Catit Grooming Kits, they are the best on the market. Read our review here and click the images to check them out on Amazon. This is one of the most important on the list. Cats need to be stimulated to be happy. Sure, having toys around the house are great but they don’t move on their own. Getting a cat wand and playing with your cat once a day for at least 30 minutes will offer them great exercise and happiness. Toys are necessary for a happy cat. Catnip is a great option for cats who not as playful. Combining the two is not only fun for you but very enjoyable for your kitty. Offer them catnip over their favorite toys a few times a week. They will love you for it! Cat trees and plenty of scratching and climbing areas is a great way to provide your cat hours of fun and to stimulate their natural instincts. This also cuts back on the damage they do to your furniture. Window perches are another great option which will allow your cat to view nature outside or just for sunbathing. Yes, cats need vitamin D3 too! Loud sounds can actually damage a cat’s ears. Things like the vacuum, bags, or large objects being moved can terrify your cat. It is best to avoid doing this when your cat is in the same room. If you have surround sound, be sure not to turn it up too loud. Allow your cat to go in a closed off room when vacuuming or moving large objects. If your cat is scared of bags, be sure not to change the trash bag with kitty in the room. How do you show your cat you love them? Share with us in the comments!